Any discussion on Bible verses about God’s love could start and end with John 3:16. God’s love is so vast that He loves all the people of the world – from its creation to this present day and into the future. He decided to send His Son, Jesus Christ, to die on the cross for our sins. God’s hope is that we will believe in Jesus and accept Him into our life. In doing so, we begin a personal relationship with God and everlasting life awaits us with Him in heaven when we die. This passage may not be one that immediately comes to mind but I think it shows an important point. The heavens and earth and all that is in them belong to God. He created it all to showcase His glory. But that wasn’t enough for Him. Instead of relishing in His own glory in the heavens for all eternity, He chose to create mankind. He created us so He would have someone to love. And His desire and hope is that mankind will choose to love Him back. God doesn’t just love a little. He loves a lot! He is FULL of compassion. His love tank never gets low. His love is demonstrated by being patient with us, by being kind, by forgiving us and by being merciful. And because in His being He is fully love, He would never be untruthful in what He would tell us through His Word. The love of a family member or friend may fail us one day. Not so with God’s love. His love is constant, reliable and dependable. When all others may forsake us, God will be steadfastly at our side, ready to shower us with His love. This theme is repeated over and over in the Bible in many different ways. Not only in other Bible passages which express the theme (Jeremiah 31:3 – “…I have loved you with an everlasting love; I have drawn you with unfailing kindness…”) but also in God’s actions. God not only IS inherently love but He ACTS OUT His love towards all mankind. Next to John 3:16, this may be the most important of the Bible verses about God’s love. It shows us that we can’t do anything to deserve God’s favor. We can’t be good enough to win your way into heaven. We were born sinful people and as such are naturally separated from holy and perfect God. God loves us despite our sinful nature. And don’t miss this…He sent Jesus to die for our sins before we even were aware of our need for a Savior. He laid the path to salvation out there for us to see and all we need to do is believe and accept it. Wow! What a comfort these Bible verses about God’s love are. They really speak for themselves – NOTHING can separate us from God’s love. We should always remember this but especially during times when we are feeling alone, in trouble, persecuted by man or spiritually oppressed. God’s love is always present no matter what we are going through. Because God loves us, we can go to Him with our needs. No care is too small for Him to know about. In fact, God desires that we bring our cares to Him. Even though He already knows what is going on in our lives, He wants us to go through the action of humbling ourselves and asking for His help. Love is a character trait of God. This verse makes that clear. And two things stand out to me from these verses: 1) we can only love God because He loved us first and 2) because God loved us, we are to love one another. In the way God unconditionally loved us, we are to love others in that same way. That includes those we disagree with, who we fight with and even those who don’t love God the way we do. There is a famous passage in the New Testament that is often read at weddings. It’s I Corinthians 13 and it’s all about the characteristics of love. Of course at a wedding the imagery is of how a husband and wife will love one another. But I can’t think the about the passage on another level. Go read the passage and each time you read the word “love”, insert the word “God’s” right before it. What you will find when you do this is that love – God’s love – suffers long and is kind. It doesn’t envy or behave rudely. God’s love doesn’t think evil towards us and is not looking out for Himself. God’s love bears all things, hopes for all things and endures all things. And God’s love never fails. Questions for Discussion: What other Bible verses about God’s love are special to you? When was a time when you experienced God’s love in a special way? What’s the hardest part for you about loving others? Thanks Jesus for Making Brian an instrument. Brian, thanks for these wonderful Bible verses. 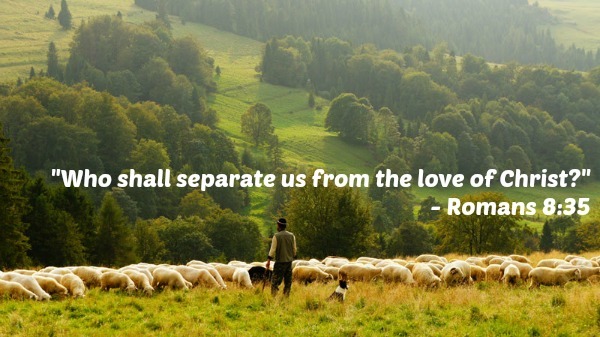 Indeed, nothing can separate us from God’s love. emagrecer de vez recently posted…Receitas Paleo, Cardápio Dieta Paleolítica Com Os Alimentos Permitidos!